Hamas in Gaza is facing an acute financial crisis as its overseas cash sources dry up. This is forcing the Islamist regime and its armed terrorist wing, the Izzadin Al-Qassam Brigades, to resort to increasingly desperate measures, such as using international aid organizations to funnel cash away from Gazan civilians. Hamas's dire financial situation has multiple causes. Egypt has effectively blocked off many smuggling tunnels linking Gaza to Sinai, which previously were used to transfer money into Gaza from Hamas donors. Additionally, Hamas finds itself without a clear international backer these days. Not only is Egypt under the rule of President Sisi decidedly hostile, but relations between Hamas and Iran are unstable, rising and falling periodically due to disagreement over conflict raging in Syria. Iran provides Syrian dictator Bashar al-Assad with military support through its own generals, and thousands of assistance fighters from its Lebanese terror proxy Hizballah. Palestinians generally oppose the Assad regime. Nevertheless, Iran sometimes does try to smuggle money to Hamas, but this source of funding is unreliable. Qatar's financial aid to Gaza has, since the 2014 Israel-Hamas war, been limited to civilian reconstruction programs. Here, too, Hamas has gotten involved, seized apartment buildings to use as financial assets. Israel's Defense Minister Avigdor Liberman told the Israeli Knesset's Foreign Affairs and Defense Committee late last month that sources of outside funding for Hamas are drying up. Recent revelations by Israel's domestic intelligence agency, the Shin Bet, confirm this situation. In August, the Shin Bet revealed that Hamas had been targeting international aid organization operating in Gaza, rerouting money intended for humanitarian assistance towards preparations for war with Israel. For example, Hamas stole 60 percent of the annual budget of the World Vision international air organization, stealing 7.2 million dollars a year from it, according to the Shin Bet. Money intended to feed and help Gazan children instead went towards purchasing weapons, building bases, and digging attack tunnels. The theft went as far as taking thousands of food packages intended for Gazan civilians and sending them to armed members of Hamas territorial battalions, according to the Shin Bet investigation. Also in August, Israel charged an engineer from Gaza with exploiting his position in the United Nations Development Program, which rebuilds damaged residential buildings, for rerouting 300 tons of construction material to help build a Hamas naval terrorist base. On Nov. 1, the Israel Defense Forces (IDF) exposed a Hamas plan to smuggle money to its operatives in Israeli prisons, and to its West Bank terror cells, by forcing Palestinians who have travel papers allowing them into Israel to act as cash smugglers. Two Hamas operatives targeted Gazan civilians at a border crossing on their way to Israel for business or medical treatment, said the IDF's Coordinator of Government Activities in the Territories (COGAT), Maj.-Gen. Yoav Mordechai. In July, the Shin Bet arrested two Gazans with tens of thousands of dollars hidden in their shoes. They were under Hamas orders to transfer the cash to operatives in the West Bank to fund terrorist attacks. Hamas intelligence agents had been approaching Gazan civilians systematically for money smuggling purposes, Shin Bet said. Hamas's financial situation is part of a larger ticking bomb that is the Gazan economy. "The whole of the Gaza Strip is in economic-civilian distress," Liberman told Knesset. Noting that 95 percent of Gaza's civilian economic funding come from the international community, Liberman said Israel faced a structural tension between its wish to improve the living conditions of ordinary Gazans and the attempts by Hamas to exploit Israel's humanitarian steps. Hamas has stolen construction material, injected into Gaza by Israel for civilian reconstruction, to build itself up militarily, Liberman said. According to Liberman, as part of its bid to keep money from the international community pouring into Gaza's economy, Hamas also refuses to resolve crises. For example, it did not take link up Gaza's purification plant, paid for by the World Bank (and costing $100 million), to the electric grid, despite the fact that Israel approved a unique electrical supply to it, Liberman added. Meanwhile, more than 90 percent of Gaza's water is unfit for consumption, and it will take at least two years for the international community to set up desalination plants on Gaza's coastline. A water crisis will likely strike Gaza long before that, Liberman said. 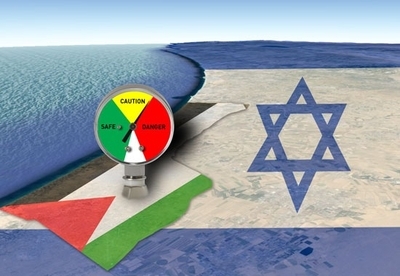 Israel is formulating a water crisis response policy. The warning signs from Gaza's economic situation continue to mount, driven by Hamas's insistence of using the enclave as a fortress of jihadist hostility towards Israel and ignoring its peoples' basic needs. Hamas's 26,000 armed members, and 40,000 government employees receive their salaries, and the regime is building up its armed forces despite the cash shortages. Ordinary Gazans, on the other hand, are on their own. the Israel correspondent for IHS Jane's Defense Weekly. His book, The Virtual Caliphate, explores the online jihadist presence.